As part of “AFAware Week” Alex Cunningham MP has pledged his support to improve the detection and treatment of atrial fibrillation and help prevent 7,100 strokes a year. Atrial fibrillation (AF) is the most common heart rhythm disturbance encountered by doctors and is associated with deadly and debilitating consequences including heart failure, stroke, poor mental health, reduced quality of life and premature death. There are an estimated 1.5 million sufferers in the UK and the condition costs the NHS £1.8 billion per year. As part of AFAware Week and the “Detect and Protect” campaign, the Stockton North MP received a pulse check in Parliament and committed to helping tackle the condition across his constituency. Pulse checks are the easiest and most effective method to detect AF, but only 38.2% of Clinical Commissioning Groups across the UK encourage GPs to carry out pulse checks. In Stockton North, there is no current policy to encourage pulse checks. When an irregular pulse check is identified, it is important that the most appropriate treatment is then prescribed. 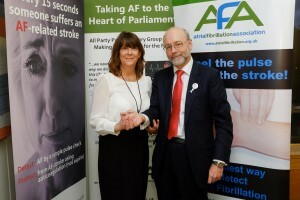 It is estimated that by doing so, 7,100 AF-related strokes could be prevented each year.